Maj. Gen. David Harris, Air Force Test Center commander, told the story of four women who saved the world at the Society of Flight Test Engineers Symposium in Lancaster Sept. 16. 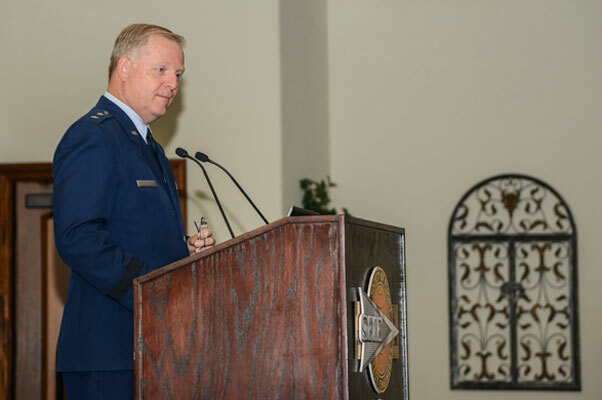 LANCASTER, Calif. — Maj. Gen. David Harris, Air Force Test Center commander, served as a keynote speaker Sept. 16 for the 46th Annual Society of Flight Test Engineers Symposium, a four-day gathering that ran from Sept. 14 through 17. 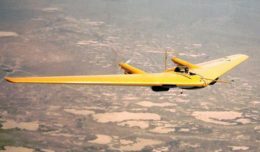 The Society of Flight Test Engineers is a collaboration of aerospace and flight test professionals that share new technologies, new flight test techniques and safety procedures. This year, the Antelope Valley Chapter hosted the annual symposium at the Hellenic Center in Lancaster, California. The SFTE Symposium is owned by the International SFTE, but is delegated to each chapter to host annually. It has been held in Seattle, Washington, Fort Walton Beach, Florida, Fort Worth, Texas, and Washington D.C. In front of about 300 attendees, Harris stressed the importance of the work that flight test engineers do and their impact on history. Harris’ story, set in the 1930s and 40s, was inspired by the “Flight Test Engineer’s Memorial” in Washington D.C.
Harris began his story in 1937 where the United States was in the depths of the Great Depression. Gen. Henry “Hap” Arnold, General of the Air Force, was a “great believer in the power of strategic airpower,” and willed the Boeing B-29 into existence. The highly advanced aircraft generated a great deal of political pressure because it came with a $3 billion price tag while America’s citizens were standing in lines just to get bread. The mission had to get done, but the aircraft had a problem – the engine had twice the power with the same amount of cooling air. The result was a bomber with an engine that caught on fire. It was 1943 and Boeing was under tremendous pressure to get the program right when a B-29 crashed into a meat packing factory in Seattle. Twenty-two factory workers and all 11 crewmembers died. “It’s a crisis. Three billion dollars of Great Depression money just crashed into a meat packing factory killing all those people in the height of World War II,” Harris said. Then Senator Harry Truman, who led the charge against poor workmanship in the defense industry, prepared a scathing report for Congress following the crash. Congress decided to force Army Air Forces to take control of the B-29 program. Harris showed a photo of a young lieutenant colonel who was made the squadron commander of the B-29 program and asked the audience to imagine his position. Tibbets turned to a couple Women Airforce Service Pilots and said, “You two, you’re pilots, come fly the B-29.” In just four days, the men in the squadron got the message – the women weren’t afraid to fly. And they too, quickly changed their tune. Disney animation artists drew logos for the WASPs and many other squadrons, some that still fly today. Harris came to the third woman who saved the world – Snow White. That film brought in a revenue of $1.2 million and Disney used that money to create a film called “Victory Through Airpower,” which outlined the advantages of airpower in the modern age. Before it hit theaters, Disney sent a copy of his film to British Prime Minister Winston Churchill while he was at the Quebec Conference in Canada. Churchill was sold on the idea that strategic airpower was the way to win the war and convinced President Franklin D. Roosevelt to watch the movie too. According to Harris, Roosevelt was convinced too, and as a direct result, bombers like the B-29 were used as strategic aircraft to reach the heart of an enemy’s industrial power rather than continue to serve in a mere support role to the U.S. Army on the ground. “It’s a volcanic rock in the middle of the Pacific Ocean that’s not good for much of anything. There’s no population, there’s no deep water port, there’s no industrial production, there’s no military except for what you see,” said Harris. According to Harris, 2,400 B-29s used the island as an emergency divert airfield in just the six months between the battle of Iwo Jima and the end of the war. Iwo Jima was defended by about 20,000 Japanese soldiers and almost none of them survived, they fought to the death. The few that did make it did not surrender until four years after the war was over. The fourth woman who Harris credited with saving the world was Enola Gay Tilbits, the mother of the young lieutenant colonel who took command of the B-29 squadron. Harris encouraged symposium attendees to stop at the “memorial to the flight test engineer” the next time they are in Washington D.C. The memorial is officially known as the U.S. Marine Corps War Memorial, which depicts five Marines and one Sailor raising the American Flag atop Mount Suribachi on Iwo Jima.